M. Scott Carpenter, who in 1962 became the second American to orbit the Earth, suffered a stroke earlier this week but is expected to recover. Carpenter, 88, was at his home in Vail, Colorado when he was stricken four days ago, NBC News reported Thursday evening (Sept. 26). The former NASA astronaut is said to have experienced "some paralysis and is having trouble speaking," according to family friends who spoke to NBC correspondent Jay Barbree. Carpenter is now recovering at a hospital in Denver. News of Carpenter's status started spreading through the space community earlier in the day on Thursday. He splashed down aboard his "Aurora 7" capsule 4 hours and 56 minutes after his launch from Cape Canaveral, Fla. 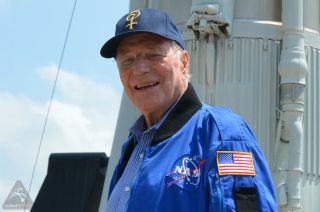 Besides his own space and sea adventures, Carpenter is popularly remembered for his radio call "Godspeed, John Glenn," which heralded his fellow Mercury astronaut's lift off to become the first American in orbit on Feb. 20, 1962. Glenn and Carpenter are the last of the original astronauts living today. A recipient of the National Aeronautic Association's Collier Trophy, a member of the Astronaut Hall of Fame and a co-founder of the Mercury 7 Foundation (today the Astronaut Scholarship Foundation), Carpenter told of his "uncommon journey" to become a Mercury astronaut in "For Spacious Skies," his 2003 autobiography penned with his daughter Kris Stoever.